Ever wondered what it would have been like to take a tour of the Titanic before its disastrous maiden voyage? While the demise of the legendary ship has long been a tragic allegory, its ocean-liner kin, the SS United States has been sinking in its own slow and painful way for almost two decades. Docked on Pier 82 along Columbus Boulevard. in Philadelphia, it’s now rusty splendor is anchored for all to see as they traverse south Philadelphia en route to the ballparks, or the nearby shopping plaza. But a number of Drexel digital media students are working on a way to help people see it in a different light: its original glory. The team has undertaken the challenge of digitally reassembling what economics and the environment have steadily divested from the 990-foot, seven-story nautical titan since it was decommissioned in 1969. Their goal?…Produce an interactive, three-dimensional digital model of the SS United States that will allow people to take a virtual walk-through of the maritime icon that, over the course of 400 voyages, hosted celebrities, dignitaries and leaders from around the world. From the outside, the ship looks about like you’d imagine a vessel built in the mid-20th century. The SS United States displays the hopes, dreams, engineering and design prowess of a nation coming out of a long economic depression and World War, poised for a new age of prosperity. But the inside tells a different story. Gone are the deck chairs, the banquet tables, the theater, the glass etchings adorning the first-class lounge. Not to mention carpets, light fixtures, floors and just about anything that could be salvaged for scrap value…right down to the propellers. The prospect of returning the ship to her former splendor piqued the interest of Drexel digital media undergraduates, Zach Stockmal and Justin Wu. For their freshman STAR Scholar design project, the pair made a digital model of the ship’s Navajo Lounge – an intimate cocktail room on the ship that hosted passengers – including the likes of John F. Kennedy, Jackie Gleason, Salvador Dali, Marlon Brando, Judy Garland and Kim Novak. Jackie Gleason was among the celebrities who cruised on the SS United States and frequented the Navajo Lounge. The Navajo Lounge was the first digital modeling project undertaken by the Drexel students. Prince Rainier and Princess Grace of Monaco aboard the SS United States. The students’ animated renderings caught the eye of a group of five seniors in the program. This group is now expanding on Stockmal and Wu’s work with the goal of modeling a major portion of the promenade deck and producing an interactive digital map that will allow visitors to tour the virtual space. For guidance, the group used historical reference material provided by the SS United States Conservancy, a group that acquired the ship in 2011 and has since been paying to keep it docked and maintained. 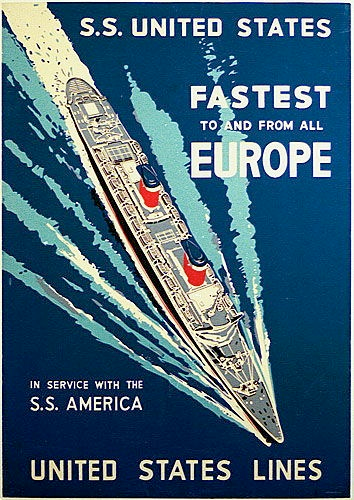 They also pulled together online resources including old photos, videos and postcards of the SS United States when it was still shuttling people across the Atlantic and cruising the Caribbean, before setting off to build digital versions of everything from the furniture to the fixtures that once adorned the vessel. Using a digital animation program called AutoDesk MAYA, team members divided the project into three phases. Headed by lead modeler John Novak and assisted by James Maguire and Jessie Wu the team first created digital models of the structures of the deck and the partitioning of the rooms. Then, they started building the elements in each room: the chairs, the windows, the lights, the tables, even a piano – matching them as closely as possible to the reference photos. Students digitally created each piece of furniture and every interior detail of the ship’s Promenade Deck. After the digital drawing was complete, students added color and texture. 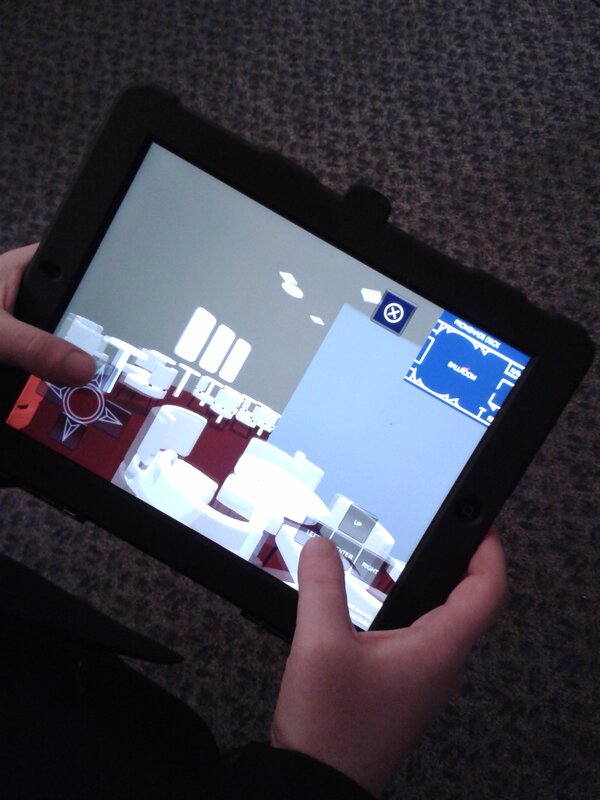 Using a floor plan, the students were able to place each of the virtual objects in their rooms. Next, they had to place all the furniture in each of the rooms. The students obtained a copy of the original floor plan from the Conservancy to help lay out each room on the promenade deck. Finally, senior Tom Welker mapped the 3D models and, with classmate James Maguire, textured the gray models anddigitally “painted,” them as closely as possible to the original colors and textures of each element in the rooms –right down to the etched glass in the first class ballroom. The etched glass of the First Class Ballroom was a particularly challenging detail for the team. The digital media students took special care in creating the texture and lighting of the etched glass. This was where the team faced its biggest challenge: recreating the environment onboard, the look and feel of being a passenger on the fastest ship to steam across the Atlantic. 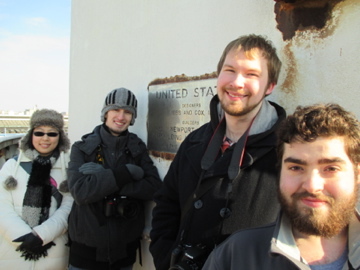 The Drexel students were afforded a rare opportunity to tour the ship as part of their research. To answer this question, the group got a rare opportunity to step onboard. While the two-hour tour was limited to the promenade deck –so the students could visually document the area- it’s something few people have been able to do, aside from the intermittent tours that the Commission hosts as fundraisers. A bustling Promenade Deck from the ship’s prime. A look at the 550-foot Promenade Deck. A look at the current state of the deck, captured on the group’s tour of the ship. The group’s visit to the ship helped it to recreate the experience of walking along the Promenade Deck. With historical reference data in hand and the experience of being on the boat in mind, the team’s lead programmer Chris Elliott is now working with Jessie Wu and Level Designer John Novak to produce the interactive map that will enable a virtual tour of the promenade deck. This requires plugging their models into a game engine -a tool typically used to create lifelike virtual worlds in video games. The process will result in an experience similar to filming a walk-through of their digital ship. Not unlike this home movie, shot by United States purser Jim Green on his trip to the West Indies in 1964. At the end of April, an animated tour of the students’ interactive model will join the “SS United States: Charting a Course for America’s Flagship” exhibit, which is on display at the Independence Seaport Museum through September 14. Visitors to the Museum will be able to tour a virtual ship-shape version of the SS United States and get a feel for what it was like during one of its 400 transatlantic voyages. The tour features a dozen stops including the Navajo Lounge, the observation lounge, the promenade, the first-class smoking lounge and two of the ship’s theaters. In June, the students will post a self-guided version of the tour online, so virtual visitors from around the world can roam the halls of the SS United States. A working preview of the tour is available here. Visitors to the Independence Seaport Museum will be able to experience a virtual tour of the SS United States. With sustained interest from future generations of digital media students, a complete virtual resurrection of the ship is well within reach. The exhibit and the Drexel digital media project are part of the Conservancy’s ongoing efforts to raise awareness about the ship’s plight and to save her from the scrap yard. Since October of 2013, the Conservancy has also been preparing the ship for future redevelopment and courting developers. Contact Drexel News Officer Britt Faulstick for media inquiries regarding the digital media project, bef29@drexel.edu.